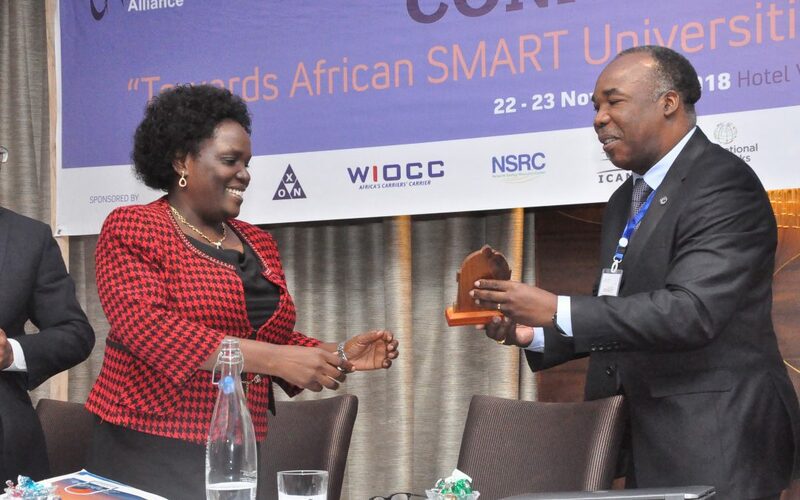 Minister of Education, Science and Technology for Tanzania Prof. Joyce Ndalichako on 22nd November 2018 officially opened UbuntuNet-Connect 2018, the 11th annual networking conference of UbuntuNet Alliance at Hotel Verde in Zanzibar, Tanzania with a commitment from the Tanzanian government to support the Tanzania Education and Research Network, (TERNET) in its quest to lower bandwidth cost for local institutions of higher learning. The two-day conference which ends Friday, 23rd November 2018 is being held on the exotic island of Zanzibar under the theme : “Towards African Smart Universities: Services that Matter.” Several activities and meetings including two NREN engineer training workshops, Libsense workshop and the Vice Chancellors ICT Forum preceded the networking conference which has attracted over 250 participants from the global research and education community. Opening the meeting, Prof. Ndalichako said she is impressed with the noble work organizations such as UbuntuNet Alliance are doing in trying to bring down bandwidth cost. “We are aware that despite the progress the global world is making Tanzania continues to lag behind in the uptake of ICT and innovation and this is mainly due to the prohibitive cost of bandwidth as well as slow speed internet. We are happy that organisations like UbuntuNet Alliance are helping local entities like TERNET to help us solve this problem. As government we are committed to helping TERNET have the required resources to reach the acceptable levels of ICT advancement that can allow the country participate in global agendas as we can not afford to continue to lag behind,” she said. Earlier, TERNET Chairperson Prof. Idriss Rai had brought to the ministers attention the disparities in regards to bandwidth cost within the Eastern Africa region which indicated that bandwidth cost in Tanzania is ten fold expensive as compared to in neighboring countries like Zambia and Uganda. Prof Rai also called on for increased uptake of bandwidth saying the available amount is on the lower side for meaningful research and education activities. In her remarks, TERNET CEO Dr. Magareth Mushi expressed gratitude to UbuntuNet Alliance for choosing Zanzibar to host the conference this year saying the opportunity had given the local NREN the needed exposure for collaborated efforts to solve common challenged besieging Tanzanian higher education institutions. Dr Pacsal Hoba, CEO of UbuntuNet-Alliance said the Alliance is committed to connecting more NRENs in order to reduce internet cost for universities as well as bring value adding services that can aid transformation of universities into SMART entities.